When you’re planning your gift giving this season, there are no little people, but there might be a need for little gifts. Small tidings of joy that share your sentiment without breaking the bank. These gifts are great for stocking stuffers, colleagues, friends, cousins’ cousins, and people who make the rest of your year easier… They are also all under $25. 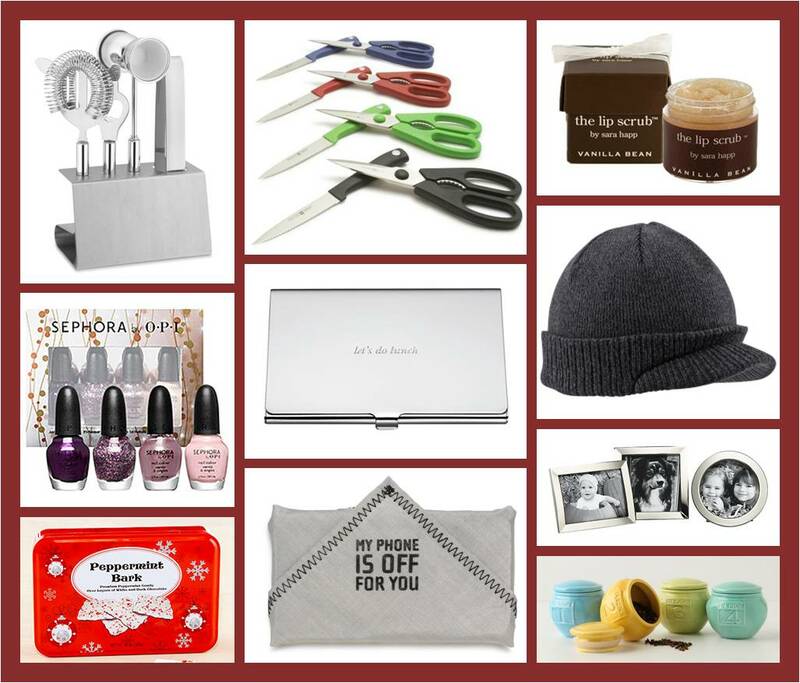 There are gifts here that are great for guys, great for gals, great for foodies, great for funnies. It is hard to go wrong when giving a gift that you’re thoughtful about! It’s so great to give a gift that pampers like a new or favorite lip color, nail polish, or very luxe beauty cream. Everyone loves a gift that feeds a passion, like cooking, entertaining, a sport, or a new career. And of course, no one turns down a gift that feeds the soul and the stomach – homemade foodie gifts are lovely, and the Peppermint Bark (at World Market for a steal!) cannot be beat. What is your favorite stocking stuffer? Tell me in the comments! This entry was posted in Decor, gifts, Her Home, Holidays and tagged 2011 gift guide, christmas gift ideas, christmas gifts for guys, christmas gifts for men, gifts for $25 and under, gifts for a college grad, holiday gift guide, holiday gift ideas, holiday gifts, mens gifts, stocking stuffer gifts, stocking stuffer ideas. Bookmark the permalink.